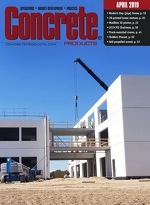 Concrete Products - Bringing Out the Final Form in Precast Forms. The winning project of the Precast/Prestressed Institute’s 2019 Building Awards – Custom Solution entailed a unique setting on the western edge of Lake Michigan in Evanston, Ill. Chicago architect Perkins + Will was faced with the challenge of keeping the foundation of the new Ryan Fieldhouse & Walter Athletics Center at Northwestern University from being damaged by waves and ice rubble. The solution: a design-build precast concrete coastal wall made up of 109 5-ft. wide segments of varying heights and tapers arranged in two planes to replicate the appearance of a wave.